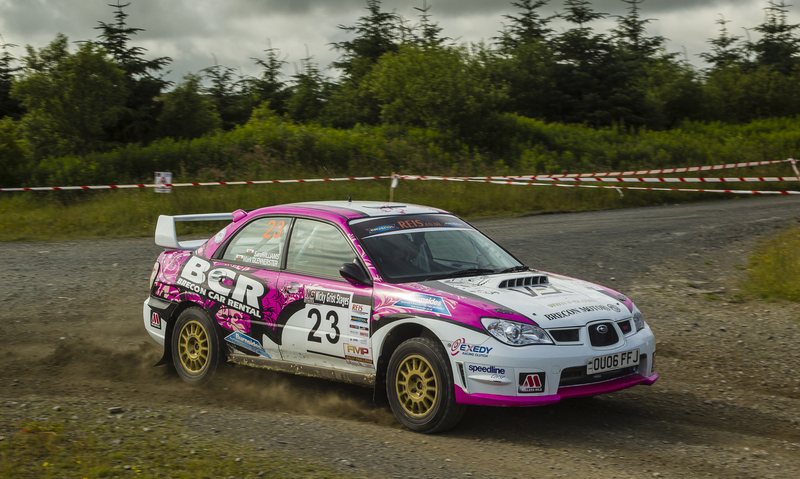 Fresh from her victory at this years Red Dragon Rally, number 1 British female rally driver Sara Williams achieved 2nd in class and 16th overall at the Nicky Grist Stages 2015, accompanied by her co-driver Mark Glennerster. A round on the BTRDA Forestry Championship, BTRDA Challenge and the FMP Challenge race calendars; Williams competed against a full complement of 169 fellow rally drivers over a hectic day of racing, notching up another solid performance. The Nicky Grist Stages is run by Quinton Motor Club, with the rally being held under its current moniker since 2012. The rally has a history spanning back from 1980, and is currently sponsored by Nicky Grist Motorsport Limited, the company set up by WRC veteran Nicky Grist as a UK importer of motorsport products. The base of operations for this year’s rally was centred at the Royal Welsh Showground in Builth Wells, with the breath-taking Epynt Ranges providing the ultimate playground for the drivers and their raucous machines. This year’s rally comprised 8 gravel stages, split by a lunch time service back at the Showground. 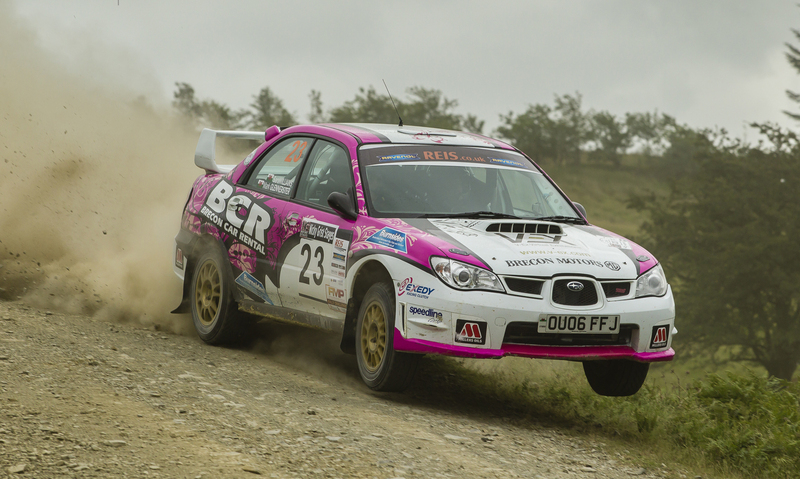 Buoyant from their last performance, Team Brecon Motors with the support of Geoff Jones Motorsport confidently readied their V-Ex Virtual Exhibitions sponsored Group N Subaru Impreza for the action to come. Sara and Mark took their place on the start line for stage 1, Monument 1, as seeded car 23 on the road. The pair would have to contend with stages infamous through their inclusion in WRC Wales Rally GB, many regarded as some of the most intimidating and testing courses in world rallying. Sara and Mark burst onto Monument 1 in perfect conditions, with the weather holding and the gravel dry. Monument 1 rises to 451 metres in altitude, snaking through green hills and close forests. After the stage, Sara and Mark jumped a place to 22nd, making for a positive start. Route 60 was the day’s second stage, a more open course characterised by the panoramic views of hills, scattered firs and long grass that only Wales can provide. Route 60 was packed with spectators, willing on the drivers and enjoying the unparalleled perspective on the action down the valley. On this the fastest stage of the rally, Sara posted an impressive 4.57, climbing 4 places to sit 18th overall by the finishing post. Stage 3, Halfway, was the next challenge for the drivers, a more enclosed stage lined with trees occasionally broken by scenic clearings. Sara and Mark completed the stage still holding 18th overall, keeping consistency at the forefront of their performance. 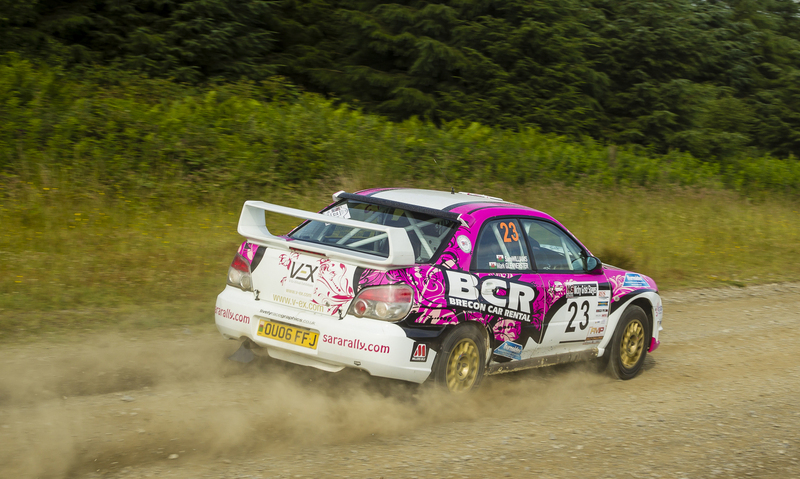 The fourth stage of the event, Crychan, was the longest of the stages at the rally, constituting 7.65 miles of gravel through mostly dense woodland. The stage has featured in the 2009 WRC Wales Rally GB course, so it offered one of the biggest challenges to the competitors. After a spin that cost around 10 seconds, Sara kept her foot down to propel her and Mark into 16th overall, posting a highly competitive 8:55. Despite adversity, Williams had kept the pressure on. After a busy morning behind the wheel, Sara and Mark took a well-deserved breather as the Brecon Motors and Geoff Jones Motorsport Teams gave the Subaru the once over. The car was in great shape, so full of optimism, Sara and Mark headed onto the road and back in the hunt. Sara and Mark re-entered the fray at Stage 5, Monument 2. Slightly different from Monument 1, Monument 2 is 1.44 miles longer than its sibling. The clouds loomed ominously over the stage, but it stayed dry over the course for the afternoon’s action. Sara and Mark completed the stage in 5.14, dropping a place to 17th. From now on the rally revisited the morning stages with the exception of Monument 1. Stage 6 was a rerun of Route 60, where Sara and Mark reclaimed 16th, knocking a full 3 seconds off their previous time. Stage 7 saw the duo again finish in 17th, as the battle for position reached a climax for the days final stage. The last stage left to run was arguably the most demanding, Crychan, which set up a real test of nerve for the racers. Eager to make amends for the earlier spin, Sara stormed through the stage achieving an 8.41, putting the day’s earlier mistake firmly behind her. Sara and Mark crossed the line 16th overall and 2nd in class, gaining reward for a concentrated day of driving. The rally was won overall by Paul Bird and Aled Davies driving a WRC 07 spec Ford Focus by 14 seconds. It had been a tough day for the drivers, but it was evident at the rally HQ awards ceremony that all had enjoyed a testing day of driving. For Sara, the event proved to be great consolidation after her Red Dragon performance; she held her own against more powerful cars and would not allow the spin on stage 4 to severely affect her flow. 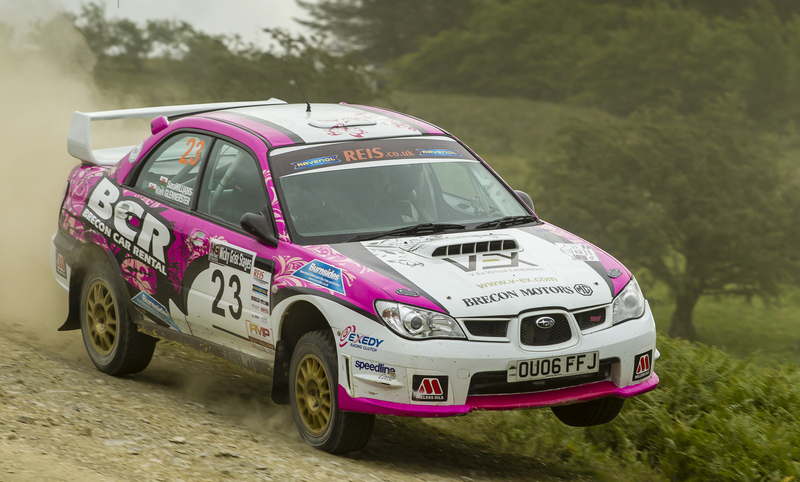 Williams is undeniably coping well with the rigours of a busy season, keeping her pace consistent, with the Brecon Motors Team and Geoff Jones Motorsport ensuring her iconic Subaru is responding faultlessly to her efforts. Rather than being a driver for the future, Sara is becoming a mainstay at the business end of rally standings, her success ultimately defined by her total commitment and focus. Photo Caption 1: Number #1 female rally driver Sara Williams pushes the limits of her V-Ex sponsored Subaru Impreza rally car. Photo Caption 2: Sara Williams and her co-driver, Mark Glennerster, finished 2nd in class and 16th overall. Photo Caption 3: The stages and the weather stayed dry throughout the event, making for perfect rally conditions. Photo Caption 4: Sara's Subaru rears into the air on stage. Photos with many thanks to Chris Huish at Rallysport Media.